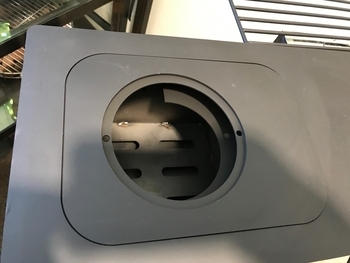 New 2018 MKlll Multi-Function Tent Stove Upgrades: See at bottom of page! The portable tent stove market is saturated with inefficient primary combustion stove designs that haven't changed in decades (high in both emissions & fuel use). While cleaner burning residential stoves have been rapidly improving and inefficient designs have been regulated by the EPA and dirty stoves have been outlawed due to high emissions and pollution. Unfortunately the tent market has never changed, offering the same dirty burning stoves they have for decades. We did something about it. After all this is 2018. Note: All stoves burn cleaner with dry fuel. 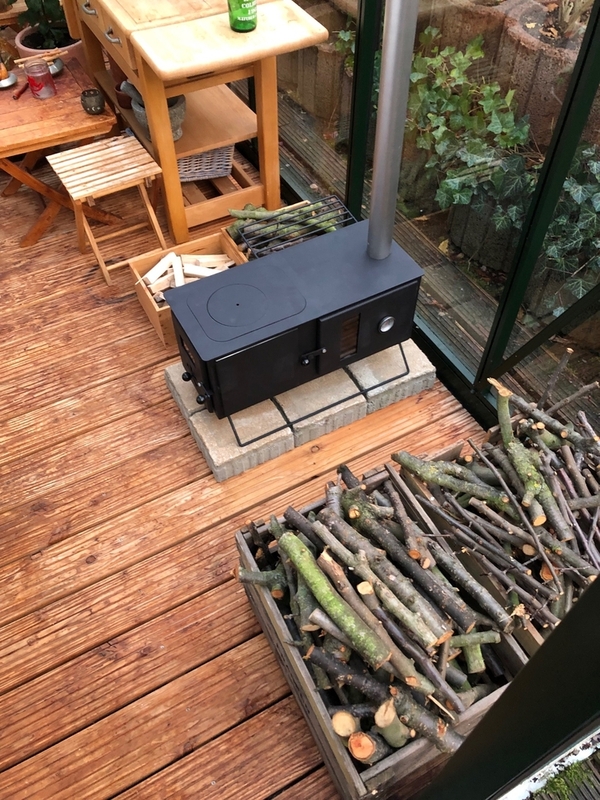 Any stove with a chimney is designed to vent emissions outdoors. Our chimney stoves are designed for use with dry fuel. Biomass fuel with increased moisture content produces smoke and results in inefficient combustion and increased soot formation. 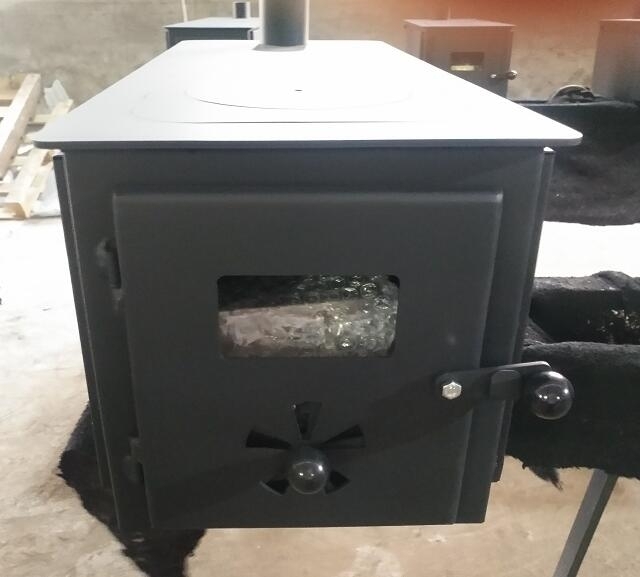 Our small portable biomass stoves without chimneys are designed for dry biomass. Burning fuel wet fuel is irresponsible and should be avoided if possible. This is a new disruptive technology in the tent stove sector. 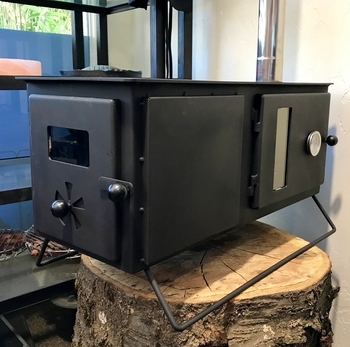 The Multi Function Tent Dragon is the World's first multi-option tent stove offering efficient re-burning of the wood gases (clean, secondary gasification) to ensure a clean burn and low fuel use. 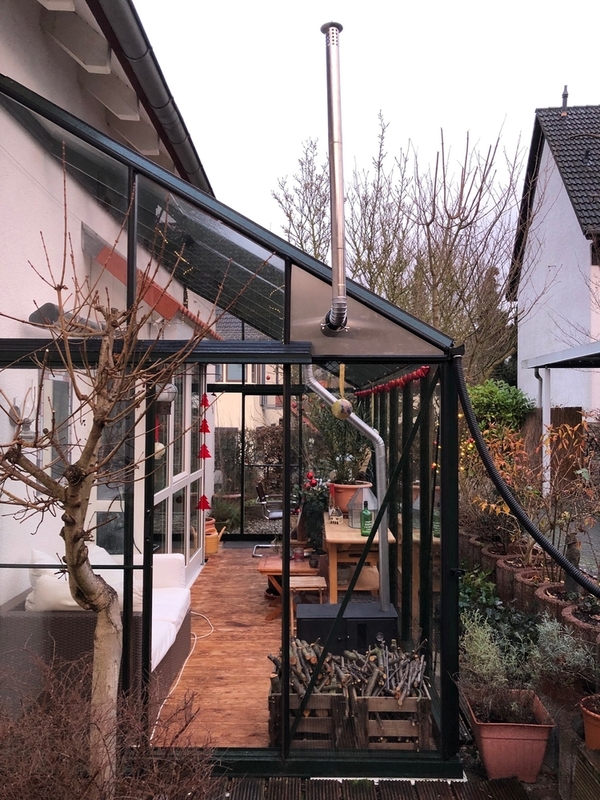 This is the first with multiple application tent stove providing high firepower frying, low firepower simmering, baking, grilling, heating water and heating in one unit! 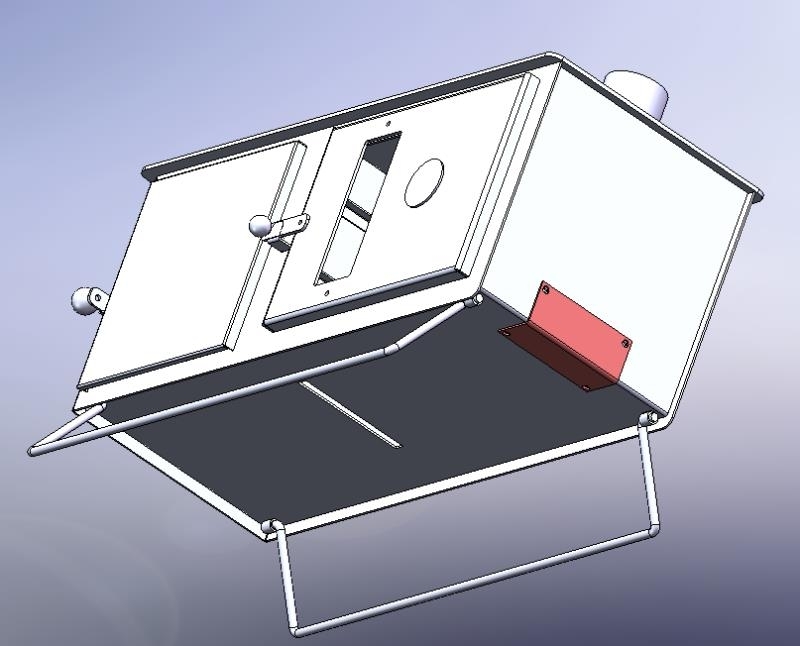 This translates to the first clean-burning portable tent stove that was not only designed for low emissions and low fuel use, but for multiple cooking functions. But that's only the beginning of this amazing new tent stove. 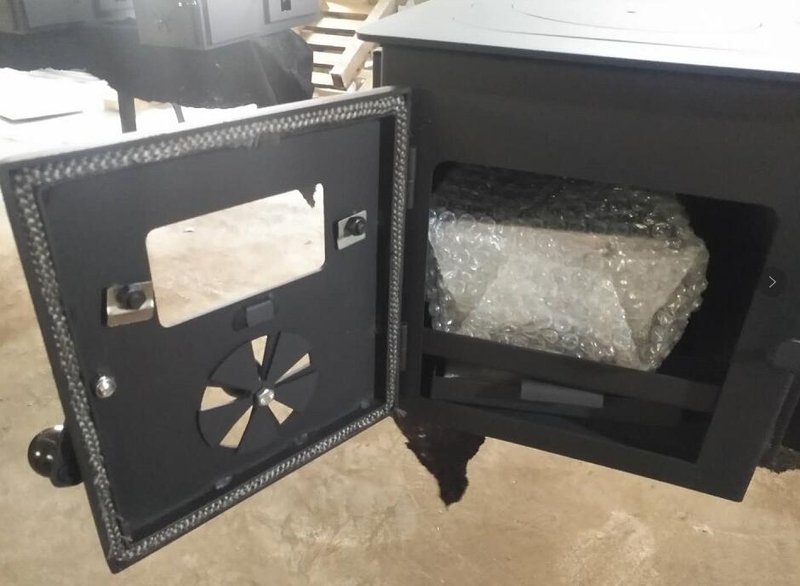 For starters, you notice the tent firebox features a glass window to view and enjoy the flame and a bake oven viewing glass. It gets better. 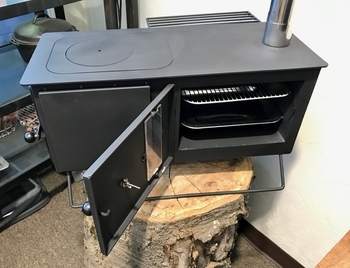 This portable unit has folding legs, that retract and fold under the stove for a compact footprint for easy transportation. 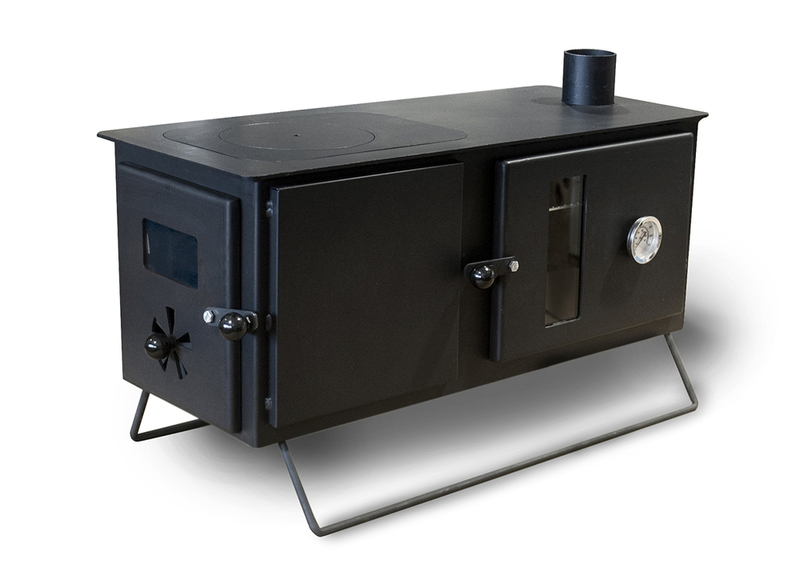 The stove has an adjustable primary ventilation dampener on firebox door and 2 rows of continuous steady state secondary ventilation positioned at the top of the firebox. A small aluminum baking pan is easily accessible slipped below the firebox grate for easy ash disposal. The 11 gauge heavy steel (1/8") cooktop has a traditional 5 & 7/8" round cooktop cut out for high firepower frying, boiling, and woking for use inside or outside the tent. A larger rectangle cut out in the cooktop allows the 7 & 3/4" x 10 & 1/2" grill insert (included) to be used when a bed of embers is established to grill outside the tent. 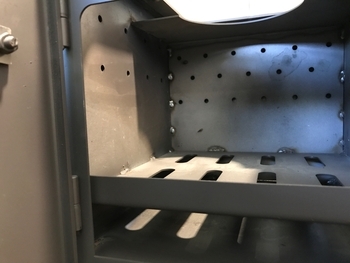 The oven rack is the grill rack and stores inside the oven when transporting along with the additional oven baking pan. 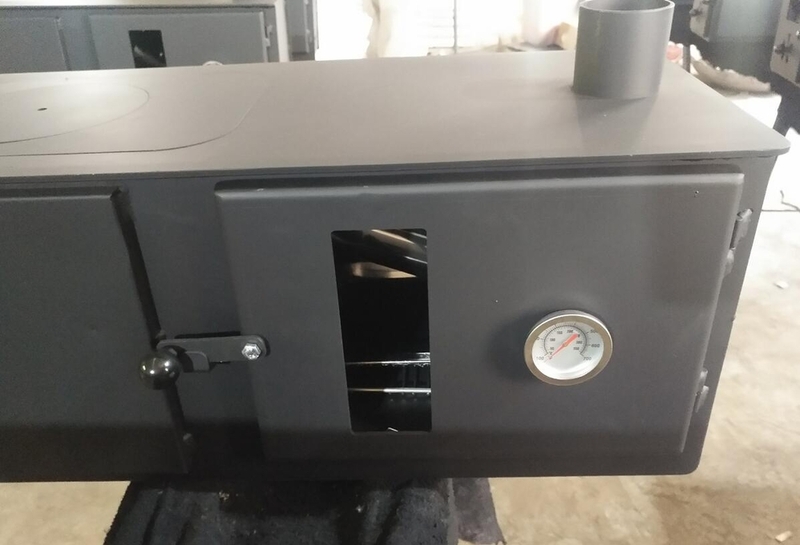 The right rear of the stove has a 10 & 1/2" wide x 9 & 1/4" x 7" tall baking oven. A removable 2 quart / 2 Liter capacity stainless steel hot water tank with brass spigot is mounted to the rear of the left. An additional 12 & 1/2 x 6" deep food or bun support rack rests above the hot water tank. 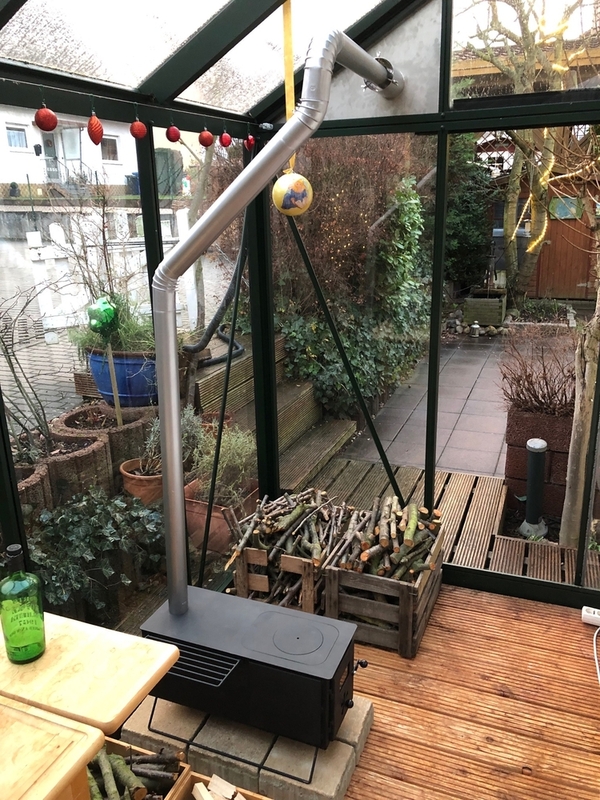 6 sections of chimney come with the stove with a spark arrester on top. The first photo shows stove displayed with only 5 sections due to showroom ceiling height. 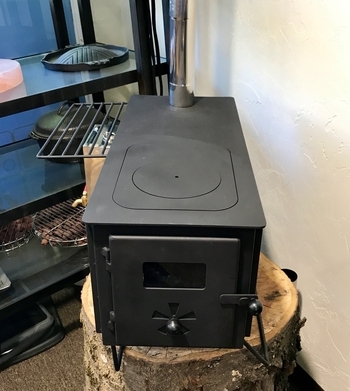 The chimney extends 89 & 5/8" above stove's cooktop surface. Another SilverFire Clean Burn Stove Design! 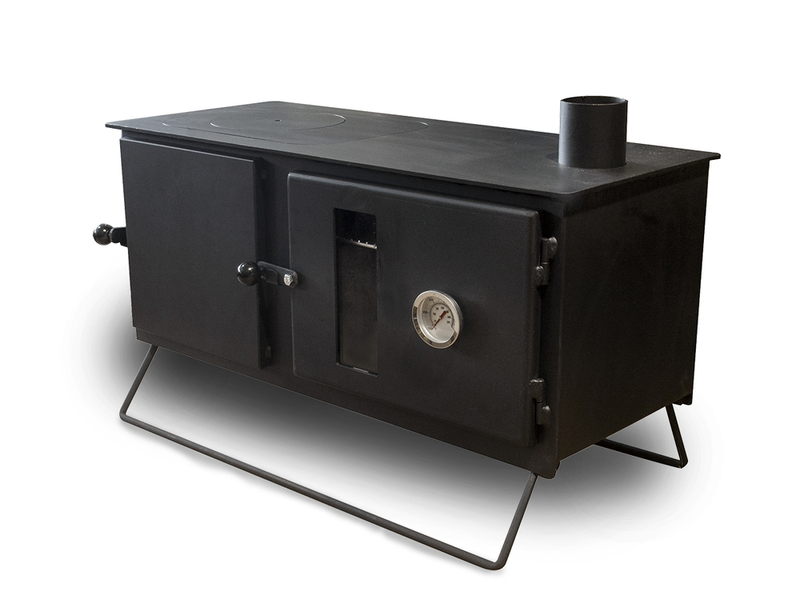 The food tray and water tank extends stove width of stove to 17 & 1/2" x in width. The leg width is 1& 1/2" wide x 22" login the support position. The oven compartment is 10 & 3/4" wide x 9 & 1/4" deep x 7&1/4" tall. The modular stainless steel chimney sections are 89 & 5/8" total height from top of cooktop surface to top of spark arrestor. The Chimney OD is 6 cm or approximately 2 & 1/4" in diameter. The stainless steel thin wall stove pipe is easily manipulated if it is out of round, if dropped or stepped on. Simply insert round tube (dowel stick, pipe, etc...) and re-shape female bell in clockwise or counter clock wise rotations. Never use pliers, you'll ruin the shape of the chimney wall construction. You may choose to wear gloves handling chimney pipe assembly or disassembly. All chimney pipe suppliers recommend gloves to prevent cutting fingers when handling thinly walled chimney pipe edges, which can be sharp. All our SilverFire stoves can be top lit or bottom lit. We find top lighting the stove is most efficient, cleaner and easier than bottom lighting our stoves. The fuel pile can burn downward like a candle and it is easier to light in this fashion. Simply take stove fuel (small logs, kindling, etc...), and place in the combustion chamber with smaller tinder on top. Top light tinder, it's that easy. Some folks prefer to take a little pellet gel, alcohol gel and squirt in small amounts to establish the flame. Others prefer tack cloth, impregnated cotton balls, char cloth, and other fire starters. Whatever you are comfortable with is fine. Lots of fire starters and techniques out there. We occasionally are questioned about coal, in addition to biomass for fuel. Coal burns too hot and the stove was not designed for coal. Although coal could be lit and placed in the stove, it has the potential to fatigue the stove metals and potentially shortens stove life. Coal is higher in volatiles, pollution, and CO. We do not recommend coal or charcoal in stoves. 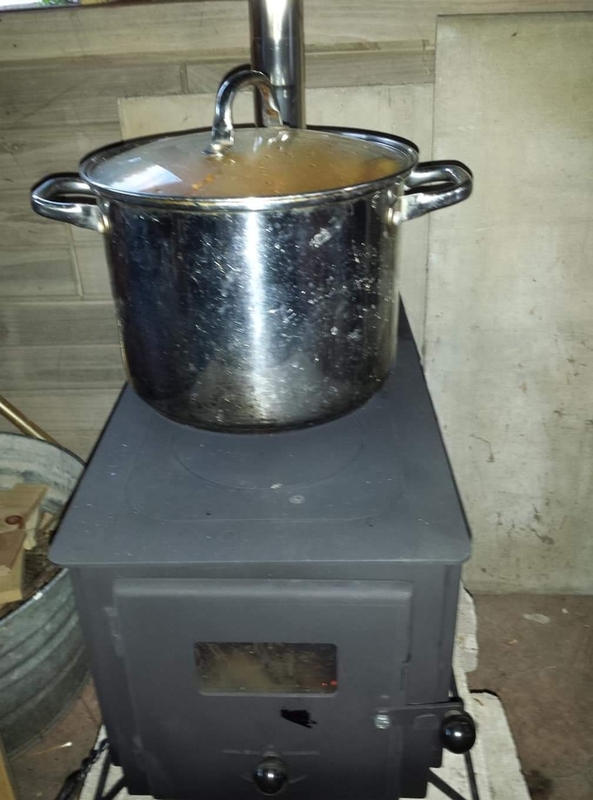 This ensures as long a stove life as possible. The stove is a rugged 50 lb of heavy gauge metal plate. The thermal mass of a stove this size typically are rated for heating larger tents, tipi's, yurts, or spaces such as 10' x 12' wall tents, or 12' x 12' Peak tents down to -30 degrees Fahrenheit. Warmer climates mean larger size tent heating capabilities. Heating ratings are dependent on ambient temperatures, season, moisture content, humidity, and wood fuel type variables. 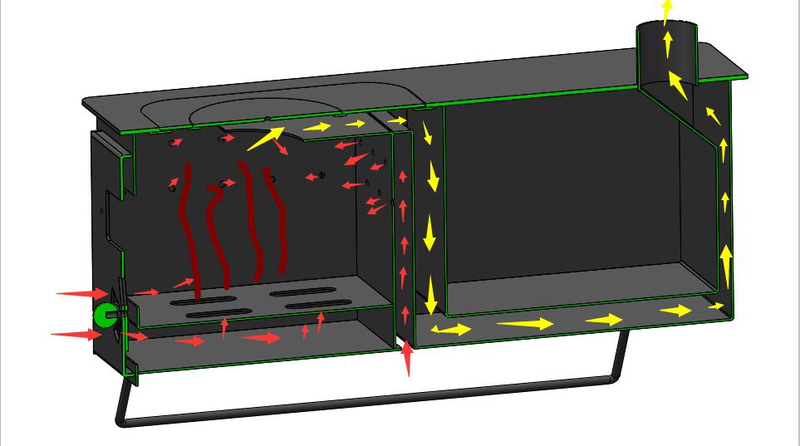 The secondary gasification firebox with baffle allows for a smaller footprint design due to greater efficient combustion. The dimension is: 9 & 1/4" wide x 10 & 1/4" deep x 7 & 3/4". About 75% of a cubic foot will call it. 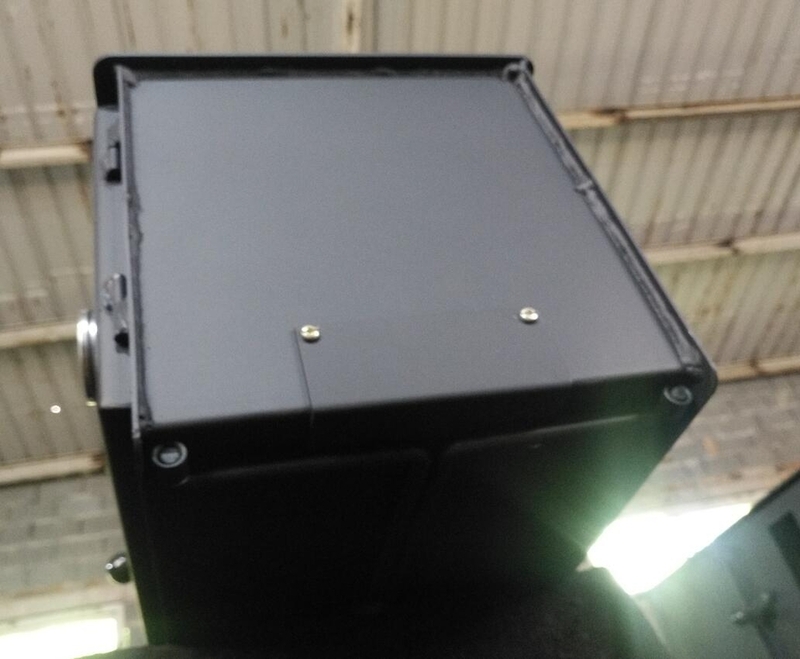 It is a small firebox with big results. Our testing results are softwoods burn about 1 hour & 1/2 with heat radiating to about 2 hours maximum. Dry hardwood significantly improves the duration of the burn. Recent dense hardwood testing resulted in a 4-hour burn with very prolonged smoldering and just fine ash as end product due to efficient secondary combustion. So anticipate a 2 - 4 hour burn maximum duration of burn when stoking the firebox with hardwood and less with softwood species. Density and species will provide variable results. 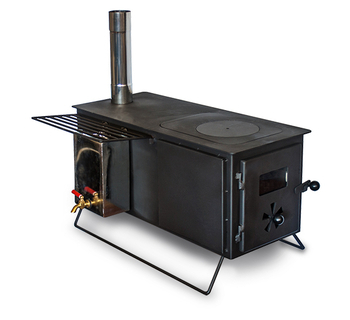 Note: This stove is a recreational tent stove for smaller footprint tents. It is unrealistic to use this type of stove as your everyday primary heating source. It is better to have a larger stove with smaller fires for heating applications. We also recommend CO monitors when using stoves indoors. 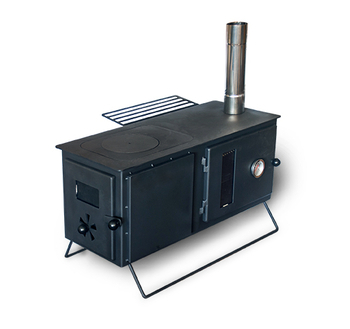 Our larger stoves fixed chimney stoves have gaskets on doors and stove glass. 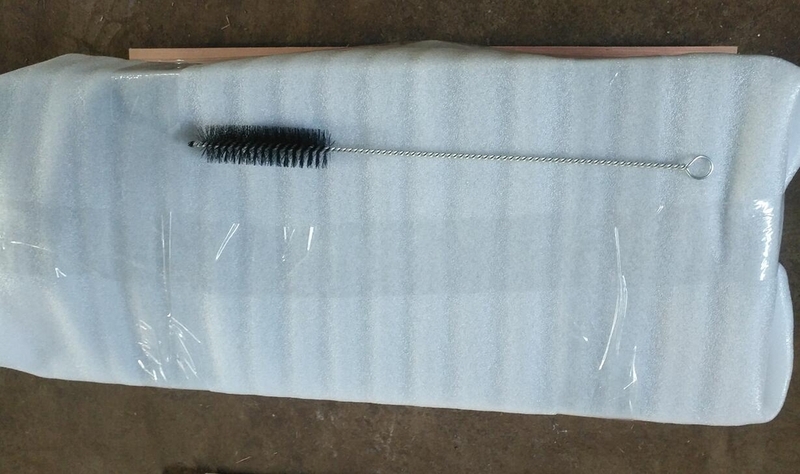 They are designed for residential heating. So, we have made biscuits, lemon poppy seed muffins, pizza, steaks, and beef bourguignon just to name a few. The Dutch oven table works well with this stove on the deck being a good 12” longer than the stove itself. Well, what can I say, Carolyn and I have enjoyed this little stove without a doubt. 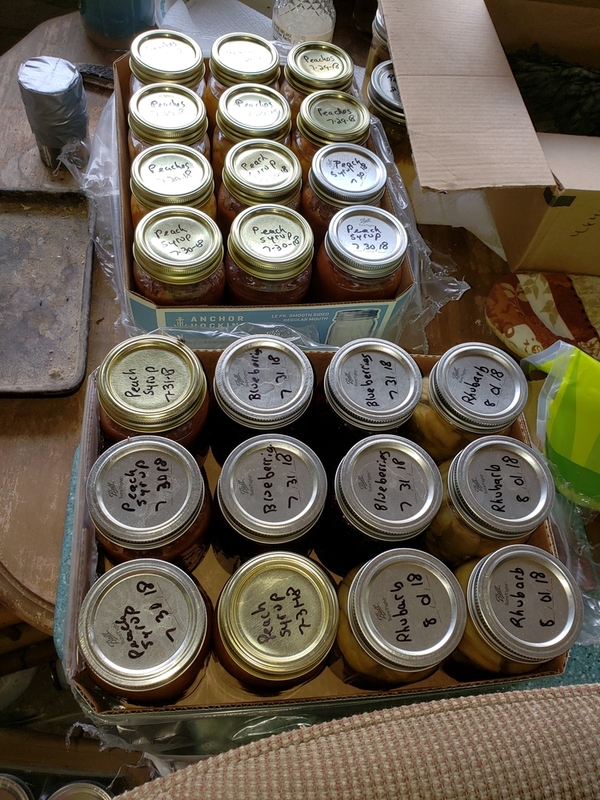 Another ambitious Tent Dragon cook just submitted these photos, canning on the Tent Dragon! Wow, we are impressed! Great job Nelani! 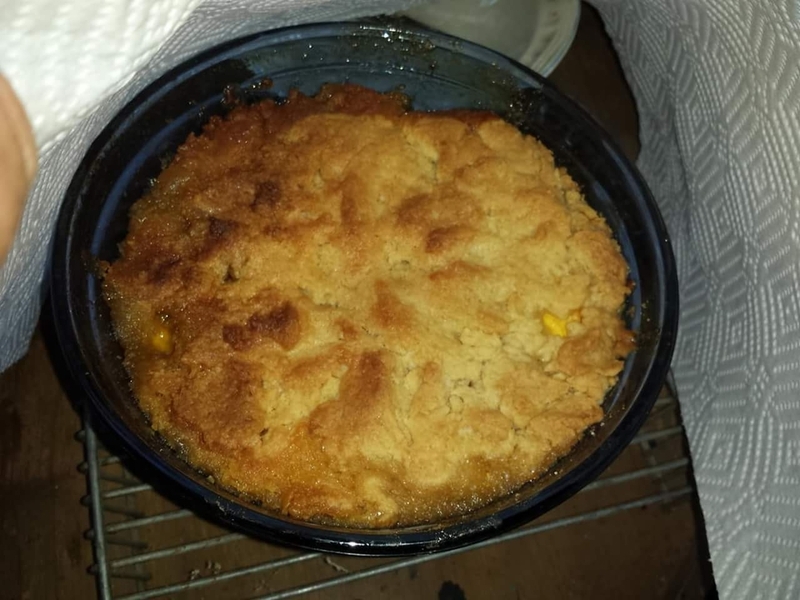 Nelani's cobbler (we are hungry)! More reviews on the bottom of the page. Recent 2018 MKlll Tent Dragon Upgrades! Review Text: I did a good amount of research on tent stoves. The Tent Dragon was one of the first I checked out and it had set the bar. It did not disappoint. Everything is as per the video on the site. Made of excellent quality and I have cooked many various things so far (I've only had it for less than a month) including frozen French fries in the oven section. The oven was shipped in strong and durable packaging. Living up in Canada, I'm delighted to have this unit ready and able to address all sorts of situations. I had to pay exchange rates from CAD to USD but it was worth it because it was money well spent!